Two decades later, performance in the art world is at the center of much debate. Whether it’s still an impoverished country on that “glittery globe” depends on what you call support (and if you’re the one getting it), how you define performance, and where and how you engage with it. 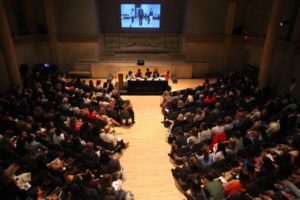 Curators, audiences, art historians, museum directors, and the small group of artists whose work is being seen or re-framed within the visual arts context each have different (and sometimes wildly divergent) sets of interests, demands, and expectations. 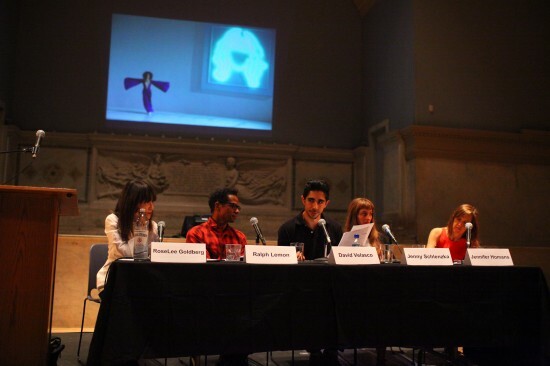 To address the widely expanding attention certain museums have been paying dance artists of late, last week at Judson Memorial Church the Performa Institute and NYU Steinhardt School of Culture, Education, and Human Development presented a panel discussion bearing the title Why Dance in the Art World? and featuring a compelling group of speakers: Jennifer Homans (author of Apollo’s Angels: A History of Ballet), who provided an introduction to the centuries-old relationship between dance and the art world; Ralph Lemon, performer, choreographer and guest curator of the upcoming performance series Some sweet day at the Museum of Modern Art; David Velasco, editor of Artforum.com and a thoughtful chronicler of contemporary dance and performance; and Jenny Schlenzka, currently the Associate Curator at MoMA PS1 in charge of live programming, and until recently the Assistant Curator of Performance at MoMA. The evening was moderated by Performa’s curator and founding director, RoseLee Goldberg, who, for better or worse, deserves credit as one of the earliest pioneers of visual arts performance in the contemporary art world. “Last year we were arguing about re-performance,” Schlenzka said. “This year we’re arguing about dance.” There’s a lot to argue about. We find ourselves in the midst of an ephemeral art explosion: the moment of performance, of dance in the art world, is happening. Is this new? Homans started off with a resounding ‘no.’ She gave us her explication of the last 3,000 years of ballet history and its relationship to art, by way of King Louis XIV, the French Revolution, and Lincoln Kirstein’s involvement with the Museum of Modern Art’s (now closed) Dance and Theater collection, all to say that dance and the art world have always been strongly linked. As she contextualized it, dance and the physical body reflect who we think we are as a society. Dance in museums, she argued, is part of a larger rethinking of public space and public life, with a shift toward the experiential: the self at the center of an experience-based life involved with the outer world through both the body and technology. Lemon, for his part, disarmingly stated: “I don’t care why it’s happening, just that it IS happening. If art is based on value, and value based on economy, and if the economy is broken, what else is there to worship or distrust?” And Schlenzka posited that the museum and exhibition model are in crisis, empty rituals that have lost their social relevance. She sees dance as a way to shake the staid museum model to its core—the institution whose primary functions are collecting, acquiring and archiving, none of which are immediately applicable to the ephemeral realm of performance. Dance allows for (once again) re-envisioning the format. As museums continue to redefine their purpose in the 21st century, performance gives them art beyond the object, both confronting and challenging the visual arts status quo. More and more Americans expect that their social, economic, and cultural activities, though shaped by a variety of sources, will engage them in a way that is vivid, distinctive, and out of the ordinary. This is even more the case for children who are being brought up in a world of interactive media, which sets up new expectations of active participation. They expect to be treated as individuals who have a significant capacity to influence as well as be influenced by any experience in their lives. Museums need to recognize that they are in the experience business and that it is the distinctive theme, context, and value of the experiences they bring to a particular audience that will increasingly define their success. The great age of collection building in museums is over. Now is the time for the next great agenda of museum development in America. This agenda needs to take as its mission nothing less than to engage actively in the design and delivery of experiences that have the power to inspire and change the way people see both the world and the possibility of their own lives. This begs the larger question—does the museum care about dance, or is dance just being used as a means to a much larger end? Merce Cunningham’s Events series at Dia: Beacon stood out for the ways in which it elevated and invigorated both dance and visual art. Most performance work in museums, however, seems to be neither aware of nor engaging with the collections. Perhaps it doesn’t have to be; in many instances, it simply can’t, as interacting with existing works risks damaging or destroying them, and museums act as their preservers. To begin developing dance in its own right, as part of the collection, is to elevate it on par with the rest, or to at least suggest that such equality is possible. Are museums finally giving dance its own place at the table? Some museums and performance curators, like Philip Bither at the Walker Art Center in Minneapolis, Peter Taub at the Museum of Contemporary Art in Chicago, Travis Chamberlain at the New Museum, and Mary Sharp Cronson at the Guggenheim Works and Process series have been presenting performance (as theater) in their spaces for years. These individuals, to varying degrees, treat the performing arts as Kirstein meant to all those years ago, in the founding days of MoMA, as something that should be thought about, displayed, and archived within the museum setting. Bither, to his infinite credit, sits down with each performing artist who presents work in his museum. His in-depth interviews with these individuals are housed within the Walker’s archive, thereby attaching long-term significance and institutional relevance to the ephemeral experience. It’s not only the show that matters, he seems to be saying, but also (and maybe more so) the artist who created the performance. His archive of interviews with choreographers and devised theater creators will be one of his most lasting contributions to the contemporary arts. The Walker, the MCA, the Guggenheim and the New Museum all have theaters within their museum walls, and present performance in a more traditional setting—though all are, in tandem, programming contemporary performance in their gallery spaces. This begs the question: why bring what seems to many to be a re-creation of the theatrical experience to the museum space at all? Lemon acknowledged the tensions and polarity inherent to the situation, in a list of questions and concerns for the encounter between dance and the visual arts. Lemon’s second constellation of questions involves the audience, what he calls visitor politics: “What do audience members assume an experience will be, given their history with either theatrical space or gallery space? What is theater? What is the theater of the gallery? What are the space politics? What is a room? What are the possibilities?” His final concern is color currency: “White space versus black space–both designed to be filled, confronted, threatened.” This is also a necessary reiteration of the problem of color currency in the arts at large. How, then, should dance exist in the museum? Because of the inherent differences of space, audience, and interaction, the same work realized in a theater space and in a gallery space can never actually be the same work. Dance in the gallery space is necessarily stripped bare of theatrical conventions (but not performance conventions): no light grid, no wings, no proscenium to frame the action, no entrances and exits, no fog machines, no trap doors. All of these are challenges, and all could engender creative breakthroughs or inspire new currents of exploration (building on the 50-year-old rejections of just such theatricality by the Judson Dance Theater). Perhaps the creation of work in the museum space is to be seen and utilized as a paradigm shift, pushing artists into new creative terrain by asking them to create site-specific new works of, as Lemon calls it, “hybridity.” In a way, dance at the museum is almost being forced to concern itself with the process, the concept, the event, the “situation” (to borrow Sehgal’s terminology) and/or the score as the primary result, rather than the means to a specifically theatrical presentation. This is admittedly nothing new to the theater, in terms of emphasis on process, but again, the point here is one of the physical parameters, the very nuts-and-bolts, of what makes a theater a different kind of space by its design, architecture and technical implementation. The open license to play with concept is also relevant here especially as it relates to controlling the level of interaction with a work. Gallery audiences tend to look, see, experience, and move on in much briefer encounters than performance audiences. At David Levine’s Habit, part of the Crossing the Line Festival, I was reminded that giving up control of the duration of an experience to the audience, in a sense “installing” a performance in a gallery (or warehouse, or other non-theatrical space) for an inordinate amount of time, can challenge our deeply ingrained patterns in both programmatic ways and in the expectations of the audience. We go to the theater expecting a very specific set of rules to be adhered to; the ritual of performance traditions is followed in many cases almost to the point of religiosity. Breaking this apart feels more plausible in the museum space, and can allow choreographic ideas to be expanded into time frames that are largely unacceptable for theatrical audiences by giving one experience, that of duration, to the performers, and giving quite another, that of watching or witnessing for as long as they might wish, to the audience. (We have productions like Einstein on the Beach to thank for bringing this revolutionary idea to the Western theater in the 1970s, though it has been happening in places like India’s cultural festivals for centuries—you eat, drink, and come and go as you please, while the performances go on all day and night, or for upwards of a week). As Velasco aptly asserts, however, when we talk about dance in museums, we’re not talking about ALL of dance. We’re talking about a very short list of people. We all know the usual suspects: Merce Cunningham, Trisha Brown, Yvonne Rainer, Steve Paxton, Sarah Michelson, Ralph Lemon, Tino Sehgal, Xavier Le Roy, Jérôme Bel. This is not only a group of choreographers, but more importantly, a group of body conceptualists. Where the visual art world is interested in dance is where dance intersects with conceptual principles and theories of the body—the relevance of the body, the experience of the body, the spectacle of the body, the performance of the body—as ordered around a visual aesthetic experience, that can be supported, contextualized and archived within the larger arc of visual art history. The museum values choreography centered around this locus in ways that justify its presence within the visual arts tradition. The artists who are beginning to be claimed, in part or in full, by visual arts institutions are those whose work can be traced with strong linearity to people in both dance and art histories; this lineage is more interwoven than ever before. We do not claim Marina Abramović as a choreographer, but she has certainly influenced dance, and was likely influenced either directly or indirectly by the principles of Judson Dance Theater. Artists like Sehgal and Abramović, already firmly placed in the visual arts world, use dancers in their explorations of the body and its limitations. Cunningham and John Cage’s “happenings” at Black Mountain College in the 1950s are credited by Schlenzka as being part of “the birth of performance.” The blurring of genre, the cross-pollination of ideas, is inevitable. With this in mind, the visual arts world must also adequately educate itself as it takes on the simultaneous task of both presenting and documenting dance and performance history. Curators and historians need to be taking responsibility for thorough research into the history and development of dance practices and performance traditions. It’s not just choreographers, then, who should be brought into museums; writers about this kind of performance, as well, should be utilized to provide richer, more in-depth contexts. All of the arts are desperately trying to find ways to maintain their cultural relevance and, to do so, a great many of them have placed their bets on experiential work, purposefully or inadvertently realizing Skramstad’s predicted future. The viewer must now have a profound, or at least memorable encounter with the artist or the show (for good or bad…think Ann Liv Young). Both Velasco and Schlenzka cited recent writings of Martin Spangberg, which are themselves based on a now-familiar mix of philosophy and theory. Spangberg argues that the art world is experiencing a shift, reflecting larger societal trends, based on many factors including labor economy and the current wave of industrial evolution from commodity-based to knowledge-based practices, from object-based to experience-based. Dance in the art world, then, is merely a symptom of our economic times. On the other hand, we may well be witnessing the comparably younger forms of modern and post-modern dance, and contemporary performance, simply growing older, becoming recognized for their experimental existence, slowly but surely earning their proper place in the institution. I saw video samples of Merce Cunningham in almost every museum I visited on a four-month trip through Europe last year. Abramović’s new center for performance art is a prime example of once-marginal work building its own infrastructure. You may not agree with her building for various other reasons (it was certainly the subject of much debate when the announcement was made) but at least Abramović is in charge of her own conversation and creating a place for her work to be adequately recorded. In an exciting way, artists are left with much of this responsibility. Choreographers and performance artists can allow visual arts institutions to define, exhibit, and proclaim as their own the work, traditions, and histories of performance, silently creating works again and again for the museum setting, or artists can take the lead in defining for themselves how they revolutionize and break apart the existing structures, educating and creating a supportive institutional structure as they go. As Cynthia Carr states: “Throughout modernism, the historical avant-garde sought to destroy the existing order—that is, the existing art tradition. ‘Flood the museums!’ cried the First Futurist Manifesto (1909). ‘Oh, the joy of seeing the glorious old canvases bobbing adrift on those waters, discolored and shredded.’” Perhaps what is needed, then, is a true commitment to radicalism. Rather than joining, becoming a complacent component within the institution, dance needs to look back at its more or less revolutionary history and begin again the process of dismantling the architecture of the immediate past. From early modern dance to the Judson Dance Theater, choreographers and body-based artists have led the way to new and broadly unexplored territories. This time around, it seems like the institutions are aware of their own looming potential irrelevance, and are begging to be saved. On with the flood. Aaron Mattocks is a performer, creator, teacher, writer, editor and curator of dance and devised theater performance. He is currently a guest editor of Movement Research’s Critical Correspondence. His writings and interviews have also appeared in the Brooklyn Rail, Hyperallergic, and Culturebot.